The Winter READ: Novel Destinations has ended. Congratulations to our Dr. Seuss book winners: Mindy McMillan, Jenalee Macy, Noah Kindred, Sophie Peterson, Lauryn Streenz, and Angie Murphy. Each won a Dr. Seuss book provided by Nancy Beveridge to encourage reading and celebrate Dr. Seuss’ birthday in March. We also had 46 other winners of Winter READ prizes, with 196 people who participated in the Winter READ this February and March. We look forward to summer reading set to begin June 1! Do you have a collection you would be willing to display at the library? We are seeking collections to display for a month at a time for the rest of the 2017 year. Stop in or give a call if you would be willing to loan the library your collection. We have had rubber duckies, antique toys, pottery, and more in the past. We would love to show off your treasures. April 7 After School Movies, 3:20 p.m. every Friday the library is open. Bring a friend and your own snack! All drinks need to have a screw on cap – no juice pouches or cans please. April 17 Heyworth Knitters and Crafters, 1st and 3rd Mondays of each month, 6:30 p.m. -7:30 p.m. This group is very willing to teach anyone who would like to learn to knit. We have yarn, instructions for beginning projects, and needles to get you started on a new hobby. If you want to learn how to knit, you must sign up to attend, so the knitters can have all you need ready for the evening. If you are a knitter or a crafter, looking to socialize with others in our area, just show up as your schedule allows. Available to anyone 4th grade and up. This group is providing projects to the local Project Linus chapter. April 18 The library will close from 1 p.m. – 5 p.m. for staff training on Tuesday, April 18 and will open 5 p.m. – 8 p.m. in the evening for business. April 20* Little Bricks & Big Ideas, 3rd Tuesday of each month at 3:30 p.m. During April, the class will be offered on *Thursday the 20th, at 3:30 p.m. due to library closure for training. LEGO building, afterschool snack, and games. Sign up at the library. K – 8th grade. April 26 Senior Info. & Assistance, 10 a.m. – Noon. The trained staff of Community Care Systems, Inc. will be here to assist people over the age of 60 and the disabled with filing for local, state, and federal programs. Their next visit will be May 24. 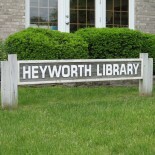 This entry was posted on April 5, 2017 by Heyworth Public Library District.